You know, I have the distinct feeling that my mother truly had a hand in creating this gem. Look, anyone with siblings knows that there it always one who is the favorite and in my family … that’s me. All joking aside, this is a very sturdy and thick-walled glass mug. 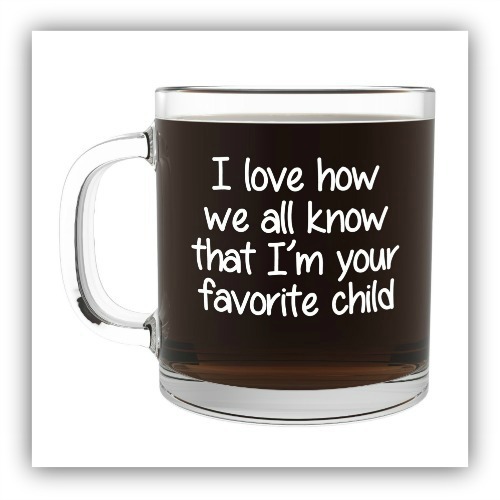 The mug is clear glass and with the white lettering that says “I Love How We All Know That I’m your Favorite Child,” you can’t really see that’s written on it until you pour in your java. Kinda neat. This makes for excellent gift for those of us who like to laugh, especially at our siblings. The generously sized 13-ounce glass mug is made in the USA, is microwave and dishwasher safe. ‘Favorite Child’ Funny Coffee Mug lists for $29.95, but is current on sale for $17.87 on Amazon! If you have a sibling, this is a must-buy for you!